With pre-release support from the likes of Carl Cox, who premiered the House Of Virus & Tom Finn Remix at Awakenings ADE last year, ‘Mushrooms (Remixes)’ officially dropped on Freakin909 this week. 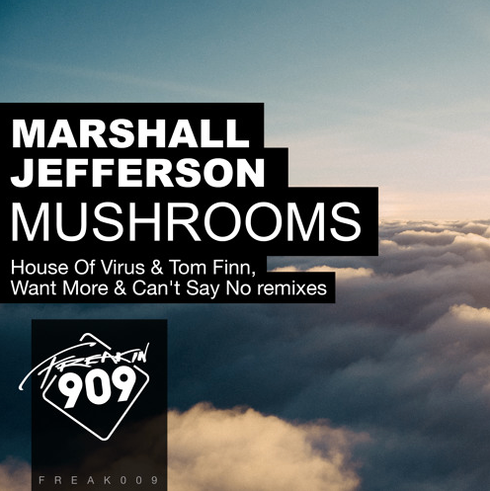 Featuring two remixes from the House Of Virus & Tom Finn and a further reimagining from Want More & Can’t Say No, the label is bringing Jefferson’s ‘Mushrooms’ bang up to date, with the blessing of Marshall himself. Originally penned and recorded for Jefferson’s Collaboration with Noosa Heads, ‘Mushrooms’ recounts a true story, in which Marshall retells of a psychedelic mushroom trip he once had in Florida that had him “walking on clouds.” This new remix EP captures the euphoria of the original, and serves it up three-ways, showcasing a new musicality. First up, House Of Virus have teamed up with producer, Tom Finn to take you on two different musical journeys. The Deep Mix features an uplifting and carefully layered synth-scape, dub elements, sinewy stabs, precision fills and percussive elements, and a breakdown – which carries you up high upon its relaxed, contemplative vibe. On their main remix they delve into tech-house territory, with a groove-based mix that warps, bends and rolls along. Rounding the package off, Want More & Can’t Say No’s collaboration draws from progressive and deep elements to create a mix laced with warm synth/bass tones, piano lines and layered breakdowns.